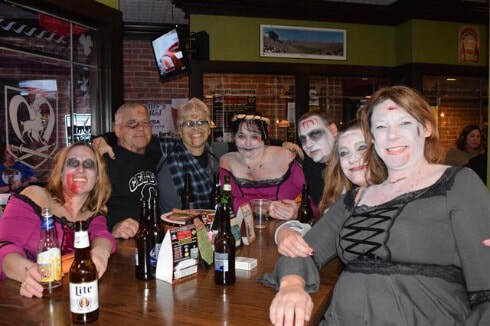 Downtown historic Port Clinton will welcome zombies from all shuffles of undead on the last Saturday in October for the annual Zombie Pub Crawl and Ball presented by Heidelberg Distributing. Zombies will crawl to participating pubs beginning at 7:00pm. ​JOIN US FOR THE ZOMBIE PUB CRAWL…. IF YOU DARE! Later that night…Everyone will be encouraged to dress in their favorite costume and join in on Main Street Port Clinton’s Pub Crawl and Ball presented by Heidelberg Distributing from 7:00pm to midnight. Participating bars include – Pub 221, Rosies, Slaters Madison Street Pub, McCarthy’s, the Bait House, the Clinton House, Jed’s and Mr Ed’s! The first 100 tickets sold will receive a free Zombie t-shirt. Tickets can be purchased for $10 at Main Street’s office or any participating bar. Zombie mugs are also available! Many downtown restaurants will have Halloween-themed menu items to satisfy your monster appetite. Ala Carte will also be opening at 8:00pm and serving til 1:00am if anyone is still hungry! Cash prizes will be given to the top three costumes as well as Best Group. Stop at the McCarthy’s between 7:30pm and 10:00pm to be judged! ** New this year – Poker Run with the best hand drawn after getting your ticket stamped at each bar.